Watch this new and full length trailer for the Dawn of the Planet of the Apes which is set to open in July of this year. The trailer was released by 20th Century Fox today. This is a follow up film to the 2011 Rise of the Planet of the Apes where the events here takes place 10 years after the events of the "Rise". The trailer is far more epic than the teaser itself, as expected, but I did not expect this one to be like this. "Ceasar is home" is the most memorable quote to me from the first film and in this new installment I will definitely hear more of Ceasar's lines as the trailer shows. "Home, family, future", "Apes, together, strong" and "War has already begun". 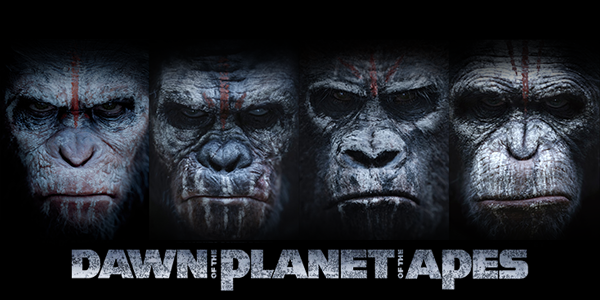 Unlike the first one, this "Dawn" promises to show us more of the Apes and more violent and action-packed scenes. As of right now there is already an untitled third "...of the Apes" film to be released in 2016. I liked this trailer and I hope this will continue all the until I see the whole movie. Apparently there are two different trailers that were released today with very few differences. Watch the other trailer below that was posted on 20th Century Fox UK YouTube channel (the other one above was posted on Dawn of the Planet of the Apes YouTube channel) and try to catch the differences between the two.